A resume is a very critical component in getting a new job. It is your one chance to capture the attention of potential employers, and you want to be sure to maximize everything you can on your resume. An effective resume will get you in the door. The good news is that I am here to help guide you through the process of writing an EXCELLENT resume. Writing a good resume is not about following a certain set of rules. This only shows that you bandwagon and follow the crowd. It is okay to break writing rules, but only for good reasons. Of course if you are in a technical and professional field such as law, academia, engineering, or other scientific fields, you will need to adapt a conservative format. This guide will, in a sense, help you to write your own resume tailored to the way you see fit, whether or not that means following a common consensus on writing resumes. This guide will be about writing the BEST possible resume for job-seeking no matter your situation. First of all, let us be clear about what a resume is and is not. It is NOT going to be your life history, or a long laundry list of everything you have done thus far. Sure, most good resumes contain a history of past employment, but they are written in such a way that makes that history very interesting to the reader. Think of your resume as a sales pitch, you are trying to sell yourself to potential employees, to persuade them that you are the best candidate for the job. So, what is a resume? A good resume is going to make you stand out among your competition and win you an interview. Let me say that again, the purpose of your resume is to get potential employers to interview you. Not one in a hundred resumes captures the attention of most employers. The good news is that with a little research and planning, you can write an interesting and effective resume. One could say that a resume is a work of art. It should be visually pleasing. The way the different sections are separated, organized, and presented should be entice readers… no one wants to read a page that is cluttered or scattered. After all, you ARE advertising yourself to potential employers. Even the use of white space should be artful—try not to have blocks of writings more than six or seven lines long. You want your resume to be succinct, easy to read. It should be to-the-point as well as direct. Rather than writing with flowery words and over-exaggerated descriptions, you want to be explicit about the results of your work (e.g. ���coordinated four fundraising teams, raised ten-thousand dollars for the company”), and focus on superior organization (use bullet points, bold and italicized font to emphasize key information). Be as concise as possible: do not hesitate to take out extraneous and repetitive information (these can be quite annoying to read). The experiences that employers will screen for are ones that show them that you can perform the job that they posted, and that you can execute that job WELL. If you write “flipping burgers” for a marketing job, that might not be ideal. However, if for the same job you wrote “provided excellent customer service and increased sales,” that might be more valuable to hiring managers. Of course, this is just an example (if a silly one) of how to maximize your resume by making it relevant to the job you are applying for. The whole idea, really, is to bridge a connection between what you have done and what your employer is looking for. 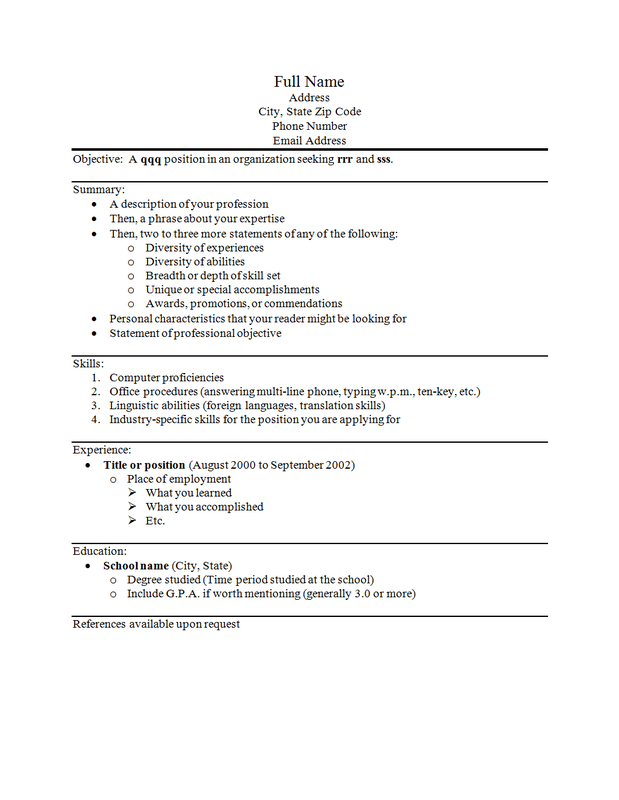 A resume must have your information, such as name, address, contact number, and email address. Be sure to list a phone number you answer regularly—you do not want to lose an interview because you missed a potential employer’s call. Employers can easily call the next person on their list. You must also have a listing of jobs held as well as education information. These are required, additional and targeted information is up to you to include. No spelling errors, no typographical errors, no syntax errors. No grammar or punctuation errors. Absolutely no errors of fact. There is no faster way to get your resume into the junk pile. You want to not only convey that you are attentive to detail, but also that you are an effective communicator. I tell you, in general when you communicate, whether you are interviewing or public speaking, or writing, you want to use power words. These are words that invoke dominant images within your audience’s minds. Power words leave powerful and lasting impressions on your listeners and a resume is no exception. Some examples of such words are: “augmented,” “constructed,” “counseled,” “dispatched,” etcetera, etcetera. So do you want to water down your resume, or empower it? Again, your resume needs to be concise and direct. Do not force your readers to guess at what your profession is. Have an initial focus so that your reader can understand immediately what you have been doing and what you want to do. An initial focus may just be “door-to-door salesperson” or “freelance photographer” written in the form of an Objective or Summary Statement. You know what your strengths are. Carefully plan and strategize to convey them to your readers. Consider whether to present information at all, how to order information, the management of space to draw your readers’ eyes to a certain location on a page, and the use of bold/italicized fonts to emphasize strong points. Your resume should be tailored to a certain goal: the job you are applying for. Any information that is included in a resume should speak to the job listed. Be clear of what your goal is and work around that. You want to plan the inclusion of key skills or expertise that hiring managers might want to see in an ideal candidate. Try to find out what the ideal candidate is and develop your resume to PROVE these key qualifications. Many self-proclaimed experts say that a resume should be no longer than one page. Have you never questioned this rule? A resume could be 100 pages long if you could keep your readers’ attention and interest that long. If an employer calls you then it is worth it, right? Sometimes resumes longer than one page are appropriate depending on the situation. If your qualifications are lengthy and varied, that is fine. However, try to cram everything into one page. If you have been in the same field for a long time, one page may be all you need to sell yourself. You may need to research your field or career to see if there is an established agreement on resume length. The main point I am trying to tell you is (you might want to write this down): do not write one too many words to get your point across. Most people only list evidence in their resume. Their resumes are long lists of their talents and accomplishments. You also want to state powerful assertions about what a perfect candidate you are, and then tailor your experiences to give evidence to these assertions. I will develop this in detail as we go through each section of resume writing. In general, we will be making assertions about our qualities in the Objective, Summary, and Skills and Accomplishments sections. We will then provide evidence of those assertions in the Experience and Education sections. Remember, our main strategy is to target and tailor information in our resumes to convey to employers that we are the perfect candidates. How do we target information in our resumes? We target by utilizing the Objective section to show readers our career goals or direction. If an employer were to choose from an endless stack of resumes, he or she is going to go for the people whose career goals match the listed job, because these candidates tend to be more motivated and enthusiastic on the job. Our ultimate goal is to tailor information in our resume to match the job description, since employers are looking for the candidates most suitable to the job. Ask yourself what a potential employer thinks is a perfect candidate. Then write down everything that you have done that makes you the perfect candidate. This part may need a little creativity. While you should be completely honest, the main idea is to be flexible in bridging the gap between your life experiences and the qualities of the perfect candidate. Once you have done that, you will be ready to make assertions about qualities that make you the perfect candidate for the job. Objective: A qqq position in an organization seeking rrr and sss. Qqq is the name of the position you are applying for, and rrr and sss are qualities or achievements that make you stand out above the crowd. A marketing assistant position in an organization seeking a diverse background in public relations and a strong record of sales. Not only does a potential employer notice that the position is exactly what he or she is looking for, but also that you are someone who will generate results and will do a great job. Most people tend to write objective statements which are based on their own private goals not related to the job, or they stop at the specific job title with no additional information to entice readers. The bottom line is that the people who make hiring decisions will want to hire people who will make powerful contributions to the company, and we want to show them that we can do that better than the other applicants. The summary section is where you want to toot your own horn; there is no need to be modest here. You definitely want to sell yourself. You will continue to make assertions about why you are the perfect candidate. This is the one section that employers might read fully, so you want to convey your strongest accomplishments, attributes, and abilities. Again, our goal is to win an interview, and the summary section is no exception. You want your readers to want to keep reading once they start, and to call you when they are done. Remember to incorporate our overall strategy: tailor information to match an employer’s needs and vision of the ideal candidate, sell yourself well, and no fluff words. This section will be a continuation of what we have written for the summary section, except that we will be providing concrete details. While you highlighted your strongest points in the summary, here you will be telling a story of those points. Remember that you are still selling yourself, so do not be modest here. You want to show what results you have produced, to prove that you are not only a big talker. If an employer were to choose between qualified candidates with similar educational and professional backgrounds, he or she would most likely choose the candidate that brought the most results to his or her company in past jobs. However, you must quantify your accomplishments or they mean nothing to hiring managers. What counts as an accomplishment? Anything that is a benefit to your company barring minimum expectations, such as regular attendance or getting along with co-workers. Accomplishments may include: special projects, promotions, decreasing costs, streamlining procedures, certifications, licensure, company-sponsored awards etc. What is a quantified accomplishment? A quantified accomplishment is one that includes number and percent figures. For example: achieved $5000 increased monthly revenue for the company within four months of hire by increasing production. Compare this to: increased production. Doesn’t say much, right? With the experience section and beyond, you will be providing evidence to the assertions you made earlier in your resume. List professional experience in reverse-chronological order. These can include employment, volunteer experience, or internship experience. As long as you develop professional skills, these do not have to be paid positions. In the heading of each experience, include a title or position, the period of time you held the position, and the place of employment. It’s also okay to come up with your own title if it accurately reflects the position you held. Following the heading, include a bullet-point list of what you did at your job: what you learned, accomplished, etc. No fluff words, get right to the point. Also, limit job descriptions of earlier jobs that you have held and focus on the most recent and relevant positions. List education in reverse-chronological order, degrees or licenses first, then certificates/advanced training. Do not include details about college except your major and awards you earned unless you are a recent graduate. Include grade point average if it is worth mentioning. Listing course work may sometimes help convince readers of your qualifications. For example, an engineering student may want to list courses in thermodynamics and engineering CAD design or any relevant courses. If no degree has been earned yet, include an expected date of completion. Or if you did not finish college, describe the field you studied, the school, and the dates (the fact that no degree was earned may be overlooked). You may write “References available upon request” at the end. This is a standard close but is usually unnecessary, because it is usually assumed. Do not include actual names of references. You can bring a separate list of references to your interview to be given upon request.